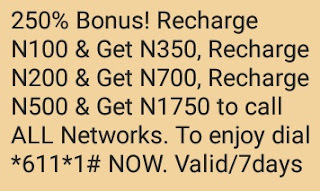 Etisalat has introduced the Super Recharge Offer which gives you 250% bonus on all your recharge above N100. The offer which is also called the “Real Bonuses Offer” is in response to Etisalat commitment to delivering innovative and quality services to its growing customers. 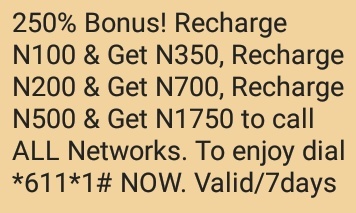 The new Super Recharge Offer is available for new and existing etisalat customers on Easy Cliq, Easy Starter, Talkzone and Cliqlite plans, and offers a 250% instant bonus on all recharges above N100 and 150% on all recharges below N100 with a simple flat tariff of 40 Kobo per second billing for all national calls. To get this offer automatically, just buy a new Etisalat sim card and make your first recharge. All new subcribers are automatically subscribed to the offer , however, if you are an old subscriber on either of Easy Cliq, Easy Starter, Talkzone or Cliqlite, you will have to dial *611*1# to get the offer activated on your Etisalat line. You can use it to call all networks in Nigeria and it is valid for 7days. Also note that the bonus call offer is charged at 40k per second ie N24 per minute and this is the best call rate compared to other networks with similar recharge bonus offers and there is no hidden charges and restrictive terms. Also in the Super Recharge offer is a data subscription of 1GB for only N500. What are you waiting for? Dial *611*1# to enjoy this offer.